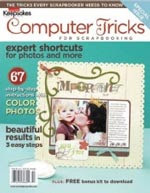 A Review of Computer Tricks for Scrapbookers by Jessica Sprague. Ready to do more with your computer than just printing out your photos and journaling? Now you can! Learn how to create inspiring borders, accents, titles, photos and more with easy-to-follow step-by-step instructions from contributing editor Jessica Sprague and her team of creative contributors. You’ll be creating quick digital elements and artistically altering your photos like a pro in no time! Think how wonderful this effect would look with all the flag pictures, etc. we'll be taking today!